Origami Owl just wrapped up their 2017 convention in Phoenix, Arizona. I’ll tell you what, the weather wasn’t the only thing that was HOT! The Fall collection was revealed and there are some really sizzling, sparkling new pieces. 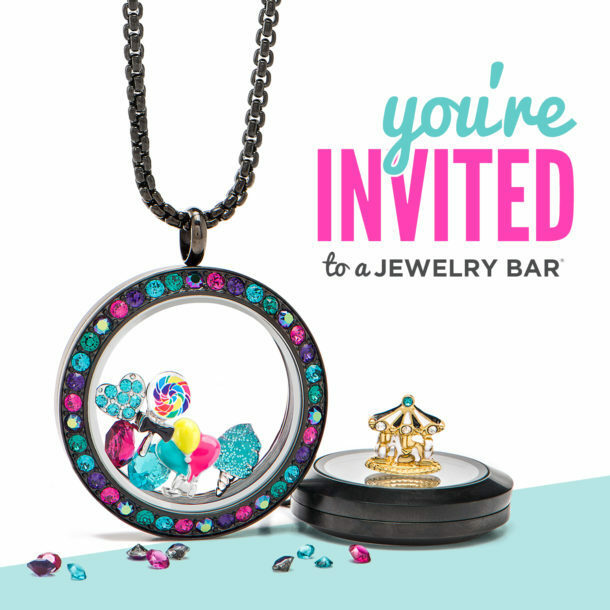 I think my favorite is a new style locket that we call the “Bar locket”. It’s rectangular and approximately 1.5 ” x .5″. It has an attached, adjustable 16-18″ chain. Tell your storyin this one on July 25th. Can you tell what’s inside that locket? This is a new charm for us. It’s the most adorable balloon animal charm in hot pink. Gun Metal locket, chain and new charms. Gunmetal is a hot trend in jewelry right now.If you haven’t seen it, you will! Leave it to Origami Owl to be right on top of the trends and have several new pieces in Gunmetal which is a hematite black with a touch of shine vs a flat black. Signature locket watches with Swarovski crystals. create your own custom look. These are just a few highlights. There are so many beautiful new sophisticated pieces in addition to the whimsy you see here. If you’d like to see the entire collection when it launches on July 25th, 2017, pop on over to my VIP lounge on Facebook to request your catalog or to keep up to date on offers and styling ideas. I’d love to get to know you and help you capture your story. Not on Facebook? That’s ok. You can connect with me on Sassy Direct.